New Harbinger Publications, 9781626259690, 240pp. It's time for a kindness revolution. 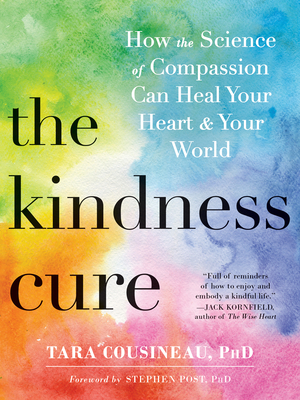 In The Kindness Cure, psychologist Tara Cousineau draws on cutting-edge research in psychology and neuroscience to show how simple practices of kindness--for ourselves, for others, and for our world--can dissolve our feelings of fear and indifference, and open us up to a life of profound happiness. Compassion for ourselves and others is our birthright as humans--hardwired into our DNA and essential to our happiness. But in our fast-paced, technical savvy and hyper competitive world, it may come as no surprise that rates of narcissism have risen, while empathy levels have declined. We now find ourselves in a "cool to be cruel" culture where it's easy to feel disillusioned and dejected in our hearts, homes, and communities. So, how can we reverse this malady of meanness and make kindness and compassion an imperative? The Kindness Cure draws on the latest social and scientific research to reveal how the seemingly "soft skills" of kindness, cooperation, and generosity are fundamental to our survival as a species. In fact, it's our prosocial abilities that put us at the head of the line. Blended with moving case studies and clinical anecdotes, Cousineau offers practical ways to rekindle kindness from the inside out. Tara Cousineau, PhD, is a clinical psychologist, meditation teacher, well-being researcher, and social entrepreneur. She has received numerous grants from the National Institutes of Health Small Business Innovative Research program. Cousineau founded www.bodimojo.com, and develops digital wellness tools for youth. She is affiliated with the Center for Mindfulness and Compassion at Cambridge Health Alliance in Somerville, MA. She is mindfulness trainer and chief science officer at Whil, a digital mindfulness company, and serves as a scientific advisor to www.kindness.org. She is dedicated to global efforts to spread kindness in both small ways and large. Foreword writer Stephen Post, PhD, is coauthor of the bestseller, Why Good Things Happen to Good People. He has been quoted in The New York Times, Parade, O, The Oprah Magazine, U.S. News & World Report, and Psychology Today. He has also been interviewed on numerous television shows, including Nightline, The Daily Show, and Stossel. A transformative speaker and thought leader, Post has inspired thousands with medical and philosophical knowledge based on thirty years of research.